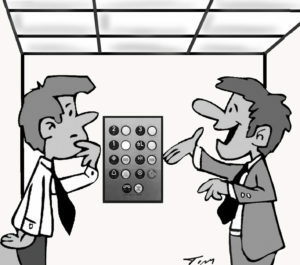 The Elevator Speech – A Business Essential - Write to Influence! “I only have a few seconds … Tell me about your product.” Bang! The clock is ticking. You are on! To succeed, a business requires more than a showstopper product or service. An author needs more than a fabulous book. You need a powerful elevator speech to promote that product, service, book … or even yourself … to the audience. And, that requires the ability to write powerfully, write to influence! Don’t have an elevator speech? No problem – let’s compose it now. Easy as 1, 2, 3! I’ll demonstrate using my own elevator speech. Strategize your message. My preferred approach is “problem, consequence, and solution.” Yours might differ and that’s OK. The key is to identify your customers and then explain why they need your item. Explain how it will improve their lives. How will they benefit? Remember … focus on the customer, not your product. Problem – Many people are unable to write with precision and focus, hampering them in achieving goals – personal and professional. The problem is rampant, exacerbated by two causes: 1) For years, academic curricula has not addressed effective writing; consequently, students graduate lacking the ability to write powerfully 2) Social media has further blunted both writing skills and the ability to formulate and present cogent, concise viewpoints. Consequence — This hurts both the individual and businesses that seek such skills. Precise communication correlates directly to their own marketing success and financial bottom lines. Solution – “Write to Influence!” … My writing strategies and techniques teach people to make every word count and each second of the reader’s time play to their advantage. Hone your draft. Now that we have the story, hone it into an elevator speech. Central to this effort are the 3Cs of powerful writing. The text must be clear, concise, and compelling. I call this “word sculpting,” consciously choosing each word. With some thought, we arrive at a 28-word description and a slightly longer version for other applications. 32 Word Description: Powerful writing changes lives! It is also the lifeblood for successful organizations. With “Write to Influence!” learn to compose text—clear, concise, and compelling—to beat the competition and achieve your goals. 82 Word Description: Powerful writing changes lives! It correlates directly to success, personal and professional. You may be the best candidate, but if the competition is better at telling a story, you lose. Want to win that academic scholarship, promotion, or business proposal? Advocating for a grant or to launch a new program? This book is tailored for both the individual and for private business; corporate, academic, and governmental organizations; and NGOs. With “Write to Influence!” you will generate clear, focused text to edge out the competition. Now engage! Pitch that amazing elevator speech at every opportunity. This includes talking to strangers standing with you in check-out lines in the grocery store, at the post office, on the metro, even waiters in restaurants! Whenever people inquire, “How are you?” … don’t squander that golden opportunity. This is the cue to deliver your elevator speech. Don’t respond flatly with the expected, “Fine” or worse, “It’s going.” Instead, reply enthusiastically, “Great! My product is selling!” or “Fabulous! I just scored a huge success!” or some other wonderful news related to your business. This prompts people to inquire further, offering you a platform to elaborate. People instinctively enjoy hearing good news – don’t you? Are you hesitant to speak to strangers? Sorry, but here is some tough love – get over it. You must trumpet your business. No one knows it or believes in it more than you. Like all things – to include developing the ability to write well – skill and fluency come with practice. Now, get out there and spread the word … with gusto! Well written Carla and I am proud to have been able to supply the drawing. Look forward to the new book!